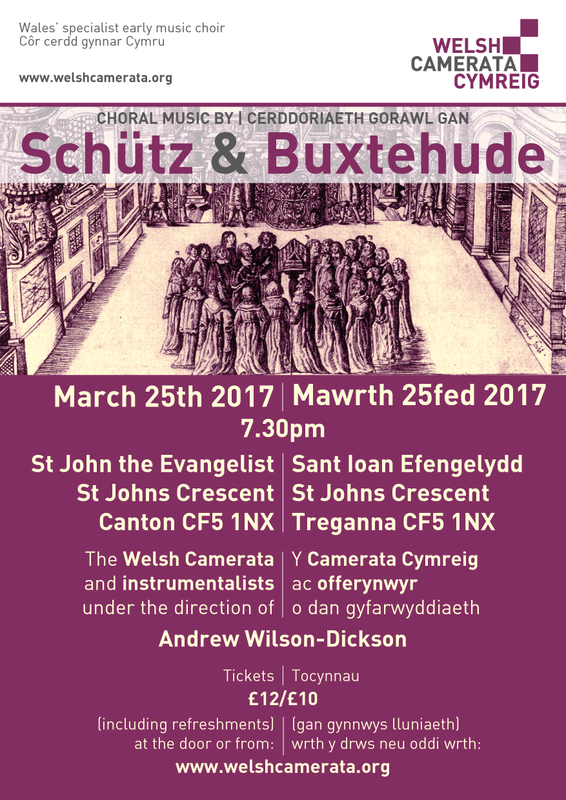 The Welsh Camerata is delighted to return to St John the Evangelist, Cardiff on 25 March. The concert is made up of music from some of the most important composers of the 17th century, working in the north east of Germany. The biggest piece is Heinrich Schütz’s Musikalische Exequien (funeral music), the first requiem written to German texts. It was performed at Henry II of Reuss-Gera’s funeral, which Henry himself had carefully planned, commissioning Schütz to write the music to texts that he had chosen. Schütz studied in Venice with Gabrieli and Monteverdi, and the Italian influence can be seen in this piece, especially in the movement scored for double choir. Buxtehude is best known as the organist that the young JS Bach walked 250 miles to hear, staying three months to study his playing and approach to his art. As well as numerous important compositions for organ, Buxtehude wrote over 100 cantatas, two of which will be performed at this concert – O Gott, wir danken deiner Güt (O God, we give thanks for your mercy) and Fürwahr, er trug unsere Krankheit (Surely he bore our sufferings). Welsh Camerata also performs Hosianna filio David by Samuel Scheidt, whose text is partly in Latin and partly in German. The choir will be joined by a string ensemble, who will also perform shorter items between the main pieces. Tickets £12/£10 at the door or from www.welshcamerata.org. The price of the ticket includes tea, coffee and home-made cakes.